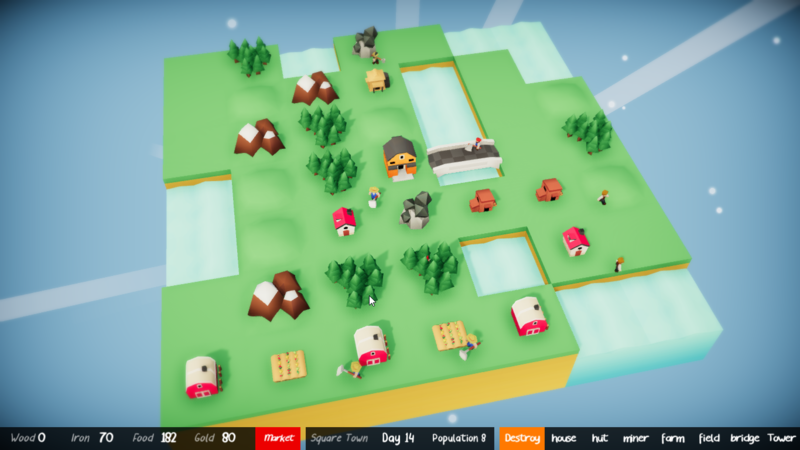 This is my entry for Small World Jam. 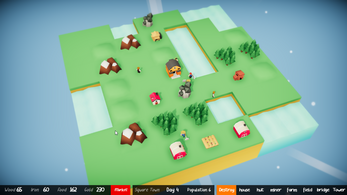 It's a very tiny city builder. 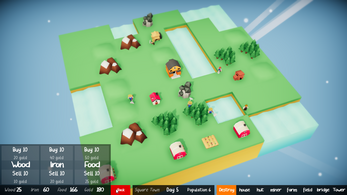 The goal of the game is to build the Tower.T o do so, you will need resources aplenty, a sizable population and your village needs to have survived for some time. This will put to test your management skills. To control the camera, hold down the right mouse button and move the cursor. I'm sure the game is super unpolished and there are probably some bugs I didn't get to fix, but it should be playable. I hope you'll spend some fun and comfy times here in Square Town. Thank you so much for the incredible support. I never expected for this tiny little game to have so much following and love. Thank you all for playing it, even in its bug-ridden state. is this game still updating? Thanks for playing and for the video! I'm aware of its bugginess, I tried to fix some of them soon after releasing the game but it wasn't enough. I'm sorry if it ruined your time with the game. The game is not in active development at the moment but I'm toying with the idea of going back to it in the future, either updating it or making a SquareTown 2-kind of thing, with new features and a bigger scope. No promises though. Tried out 1.2 and realized exclusively farming is the best strategy, which caused the farmer bug to show up again due to having four farmers on a single field. 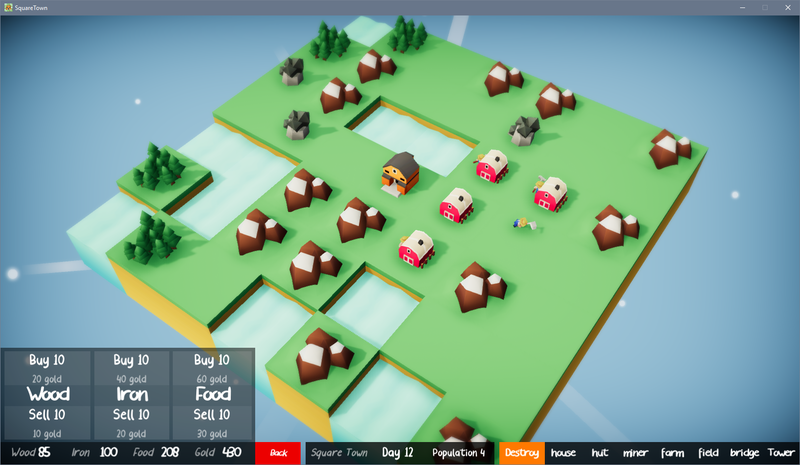 Also, you can click on tiles and accidentally place buildings through the menu, which is super annoying. You can see in the pic, I had to angle the camera so I could use the market menu. I failed. My farmers are jerks and idiots. Cool game though. -Workers will generally all try to walk to the most recently created resource spot, regardless of distance. Most evident with farm fields. -If you destroy a building (to free up a stuck worker), you can never build anything on that tile again. The map will over time become unusable. 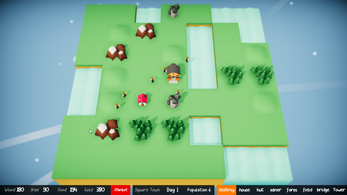 These three bugs together mean that the world will destroy itself over time as workers get stuck and buildable squares are lost. My last village starved to death while having 4 farmers stuck hoeing the ground forever. -10 Food sells for 30 Gold, not the 25 Gold listed in market. -Despite having the 200 Wood, 200 Iron, 100 Food, and 500 Gold listed in the menu, I cannot build the Tower. Am I missing a requirement? Thanks for the in-depth feedback. I was aware of some of those bugs but didn't have time to fix them. I think I'll make a 'final' version of the game with all those issues ironed out. The last bug has been reported by someone else too but I was sure I fixed it, I need to look into it again. As for the second oversight, I guess the description wasn't very clear but you need to have a certain amount of villagers AND to have a certain amount of in-game days spent managing the town. I'll fix the text to make it more easy to understand. Thanks again for playing and for the feedback.